High quality business Cards, digitally printed. Foiling, embossing and die cutting are all available, please call the helpdesk for a quotation. If you would like samples of any of our business cards, please call the helpdesk. Made from a single unfolded piece of board. 160x55mm - folded on the short edge at 85mm to make a folded size of approximately 85x55mm with a 10mm flap. 160x55mm - folded on the long edge at 85mm to make a folded size of approximately 85x55mm with a 10mm flap. Supplied creased and flat for safe transport, ready for you to fold. We start off with two different pieces of board. They are printed separately and then bonded together. This means that you can have a different colour to each side of the business card. You can even bond dissimilar card, though we don't generally recommend this. It also results in a seriously substantial card! In turn this forms an ideal foundation for further embellishment. For example a deep impression using a clear gloss Hot Foil looks fantastic on a thick card. Triplexing starts off with - you guessed it - three separate boards. Two boards can be printed on and the third is sandwiched in the middle. One of the nice effects that you can achieve with this is to have two light coloured boards on the outside with a bold colour sandwiched between. The bold colour can only be seen when the board is viewed from the side. If you want a substantial business card, this is the way to do it. A triplex with luxurious cotton boards on the outside and a Vanguard board on the inside would be more than a millimeter thick. 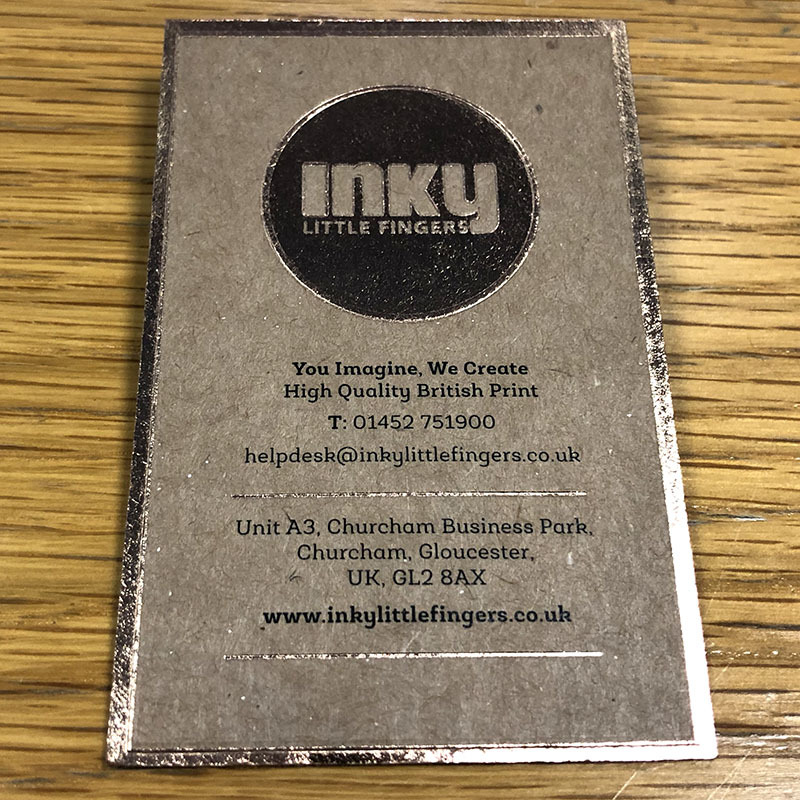 Once the business card is made, we can then further embellish it with Hot Foiling, Embossing and Die Cutting. We're happy to send out business card samples and samples of the different card that we use. Please call the helpdesk to discuss this. Our philosophy is to offer you exactly what YOU want, not what is "optimum" for cheap mass production. So for example, our 100% Cotton papers are unsized and uncalendered. This leaves the fibers relatively uncompacted, giving the sheet an extra bulky, even fluffy feeling. Gmund Cotton – Max White or Linen Cream. Pure cotton, soft and gentle, elegant and superlatively thick. Feeling is believing! This board is suitable for deep impression printing (foiling) either in the thicker version or when duplexed or triplexed. Crane's Lettra - Pearl White. 100% cotton Crane's Lettra is an extraordinary board with the feel of fabric and the look of hand made art paper. This board is suitable for deep impression printing (foiling) when duplexed or triplexed. Kraft. This is a natural brown coloured board that has been especially produced to be able to take a good quality print. The organic style of this material must form part of your design, you are not dealing with smooth white paper! Make sure you read the artwork preparation guide. Matt - White. This is a good quality board especially made for business cards, it is both bulkier and stiffer for the same basis weight (grams per square inch) compared with coated art papers (gloss, silk). Silk - White. This is a good quality triple coated silk art board. This type of product is the mainstay of most high end graphic arts based publications. It's a mass produced smooth white board that takes an excellent image. Vanguard. A range of smooth coloured board. Vanguard is made by James Cropper and the paper making heritage on the site of the James Cropper paper mill in Cumbria stretches back to 1753. If you select this option, you will be able to choose from our range of stock colours. We can also offer the full range of Colorplan, Vanguard and Pop'Set cards to special order. Please call the helpdesk if you'd like to discuss this option. A final note: it's important to match the type of card to the style of your design. For example, a card with intensive use of graphics needs a very smooth surface and might be an ideal match for silk art board. Using a beautiful, tactile, cotton paper with the same design wouldn't be such a good match as most or all of the surface will be covered up and sealed with print. A simple, elegant design might be better matched to that expensive paper. Sometimes less is more! These are our "stock" colours. We can also special order any of the colours in the Vanguard, Colorplan and Pop'Set ranges. Please call the helpdesk if you'd like to discuss this option. Sometimes you might want more than one set of business cards. For example, when you need new cards for all of your sales team. Just select the number of sets that you need and you can then choose a quantity for each set. This is a more cost effective way of buying multiple sets of similar business cards. It's important for you to understand that while you CAN have different digital print artwork for each card, if you also select Hot Foiling you CANNOT have different hot foil artwork for each card. This is because hot foiling uses engraved copper dies, not a digital process. These are the fixed quantities that we offer through the online quote tool. If you need multiple sets, each set can have a different quantity. If you need a different quantity, please call the helpdesk to discuss. Two sizes are popular in the UK; 90x55mm and 85x55mm. There is no difference in price between them. Some people feel that the 85x55mm fits better into your wallet. I suppose that depends on the size of your wallet. If you want a different size, call the helpdesk or email us us for a custom price. This is where you select whether you want the DIGITAL printing on the front only or front and back. If you want Hot Foil printing as well, you need to select that option. These cards are printed on latest generation, high end production presses. If you want a sample before you place an order, please call the helpdesk. Always make sure that you read the artwork preparation guide. The essential embellishment for standard card. As well as adding a level of decoration, this helps to protect your cards. Laminate is applied to both sides of the card. 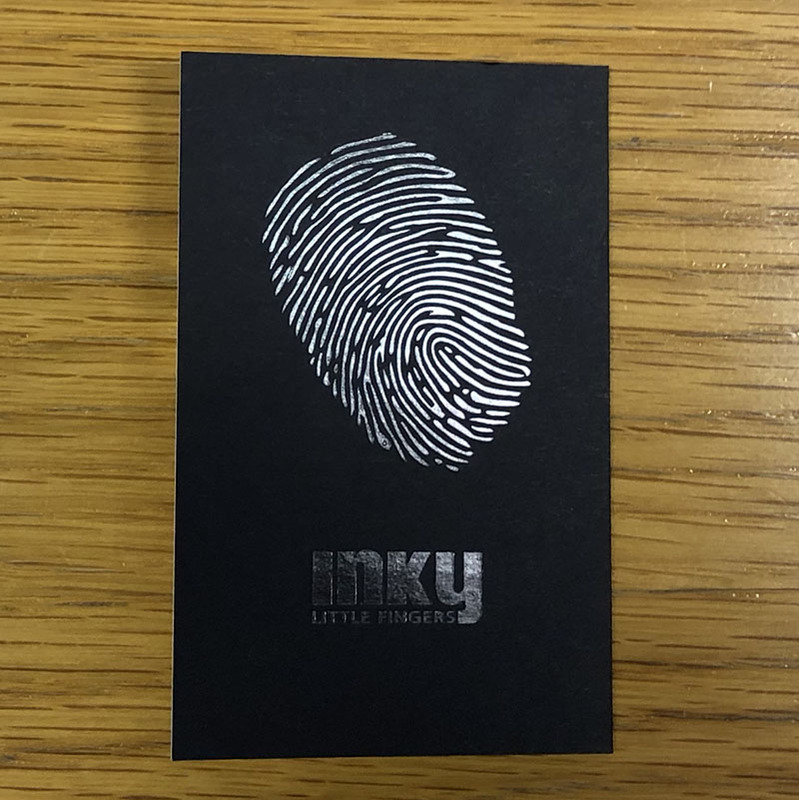 We don't recommend laminating our more upmarket card as the texture and feel of this type of board is part of the appeal and it's a shame to cover it up! Laminate is compatible with Hot Foiling and looks great together. Gloss laminate. A high gloss finish that gives the maximum protection. Matt laminate. A nice flat matt finish. Soft touch. Nearly everyone's favourite, a matt finish with a soft tactile feel to it. We stock an extensive range of high quality foils manufactured by Kurz. As well as a description, we list the Kurz reference number so that designers with access to the relevant swatch book can view the corresponding colour chip. If you request samples from us, we can usually send a colour chip or sample of the relevant foil. We cannot supply swatch books. If you need a Kurz swatch book, you must order this from Kurz directly. You can select one or two foil colours. These can be applied to the front only, or both sides of the card. You cannot change the colours between the front and the back. For example, if you choose green and red, you cannot have green and red on the front and blue and black on the back. That is 4 different colours and is a more complex process. Likewise if you want one colour on the front and a different colour on the back, choose 2 colours. If your design requires it, we can foil as many different colours as you require. However, you will need to discuss this with the helpdesk in order for us to calculate an accurate price for this work. 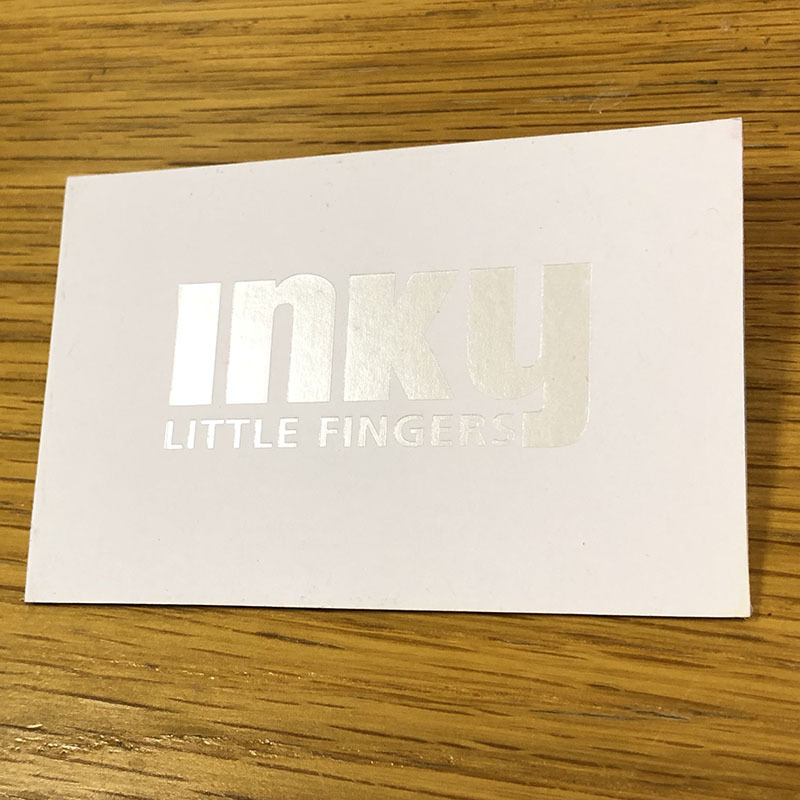 Clear gloss foil imparts no colour to the print, but it is often applied on top of a printed area, giving a highlighted, textured affect. It also looks fantastic with no print below and a deep impression. Pearl foil is translucent. If applied on top of a printed area, you can see the printing underneath, but the colour is changed with a pearlescent lustre. Matt foils are exactly that. They can look very much like traditional letterpress or lithographic inks. The main difference is that foils are completely opaque. This is a great advantage as it means you can print light colours onto dark coloured card. 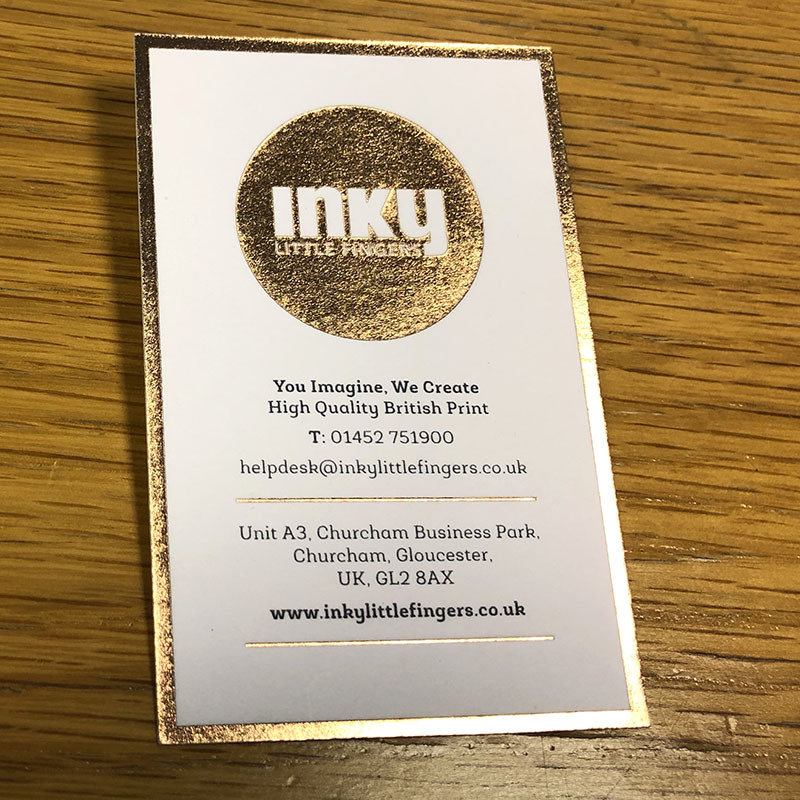 The foiled area will show bright and true, whereas the colour of inks will vary according to the colour of the card that they are printed onto. Gloss foils have a high gloss shine. We can special order a dull gloss gold and silver, though these are not normally stocked by us. If you would like this type of finish for your project, please contact the helpdesk to discuss. We can apply one foil colour on top of another. This does not behave the same as inks: if you print a red dot on top of a white area, you don't get a pink dot, you get a red dot as the foils are opaque. The only exceptions to this are where we note that the foil is translucent or clear. Please bear in mind that hot foiling is not the same process as printing and what is achievable is different. For example, you cannot create a half tone screen with foiling. Please read the artwork preparation guide for more information. In some circumstances, we can special order colours that we don't normally stock. Please contact the helpdesk if you'd like to discuss this. Hot foiling, embossing and die cutting is done using our Kluge EHD press. This is a 2.5 tonne beast that requires skilful operation and uses engraved copper or brass dies. It is expensive to initially set up, but produces superb results that are deeply impressed into the card. If you are ordering more than one set of cards, the full colour digitally printed artwork can be different between each set, but the hot foiled artwork must be the same. For example, your design might have part of your logo and business name hot foiled and each individual's name digitally printed. 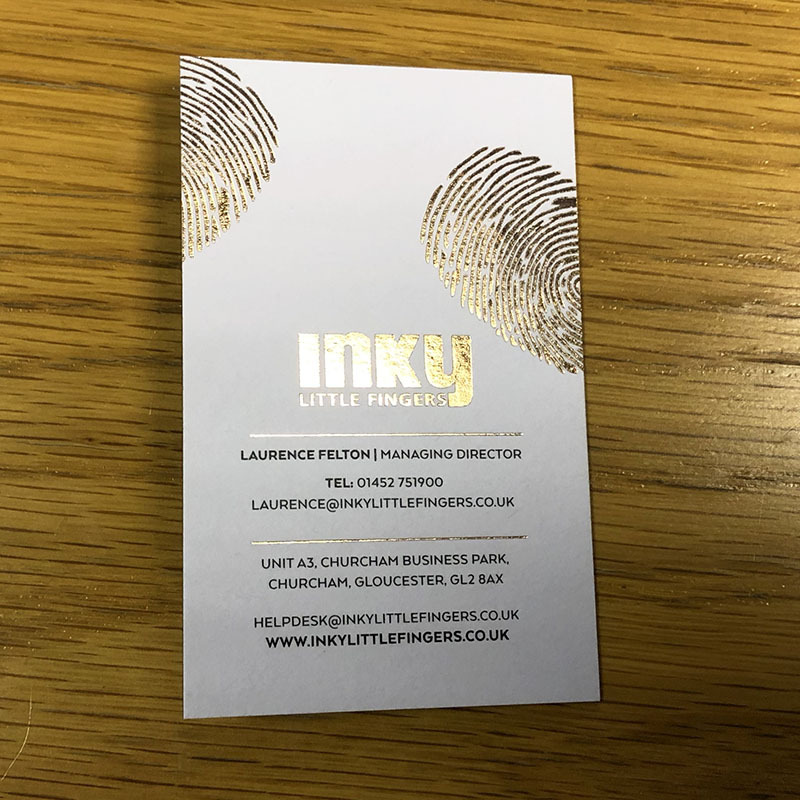 Please also be aware that if you are regularly printing business cards with the same foiled (or embossed) portion of the artwork, we can store the plates for you. These can then be reused several times and this will reduce your setup costs in subsequent orders. Please note that there is no storage "guarantee" with this free of charge service. Because this premium hot foiling uses engraved dies, we cannot combine this and our express (2 day) print service. We use a 2-part die to emboss your business card. This is typically used to create a raised or depressed area. Whereas a deep impression is formed by pressing a metal die into the card at great pressure, embossing actually reshapes the card to your desired contours. Embossing is normally combined with a printed or hot foiled area, though it can be used by itself. When applied with no other printing, this is called blind embossing. Blind embossing is often combined with a clear gloss foil to subtly highlight the embossed area. Though of course that is technically no longer blind embossing! Popular effects include embossing bold areas of text, graphical elements (for example a logo) and blind embossing. Please note that embossing can quickly become very complex once you go beyond one simple shape, or bold text. The online quotation generator will give you an accurate price for a simple emboss. There are some absolutely stunning effects that are possible that can turn your card into a work of art. However, these are more complex and we will need to discuss any such project with you and calculate the price accordingly. We can and do emboss very thick items, so in theory we can emboss your duplexed or triplexed cards. However, as the material gets thicker, the level of detail that's achievable varies and the overall effect that's achievable changes. This is getting into some more complex territory and you need to discuss this type of project with us. Two or four round corners. Four is the norm, but some people like cards with two round corners, the corners that are round are diagonally opposite. If you want two corners rounded, you will need to tell us which ones! The most difficult concept to explain is machine cut vs die cut round corners. The short version is: die cut is better, but is more expensive. The longer explanation follows! Machine cut cards are cut using our round cornering machine. Cards are put in a stack, clamped by the machine and cut with a specially shaped guillotine blade. This produces a very good result, but if you examine the cards very carefully (for example under magnification) you can see the very slight imperfections that are inherent in this process. Don't confuse this with the rough & ready round cornering you see from copy shops and quick printers, this is a good quality finish. With die cutting, the card and corners are all cut out using a single die on a large machine press. As each sheet of card is individually "registered" for accuracy and all parts are cut together, you get completely smooth sweeps from straight edge to round corner. Once die cut, the cards are still held in to the sheet of card with tiny tabs, otherwise the sheets would not feed cleanly through the die cutter. These tabs are sanded smooth by hand once the cards are extracted from the sheet. This all takes a lot more time, but perfect does cost a little more than very good. These are working days to print. Our standard print service is 5 working days to print. You can pay a premium if you want your order on the express 2 day to print service. You cannot combine Premium foiling with the express service as there isn't enough time to engrave the dies. You must upload your artwork as one or more PDFs depending on the type of card ordered. Colour Match To Other Stationery? 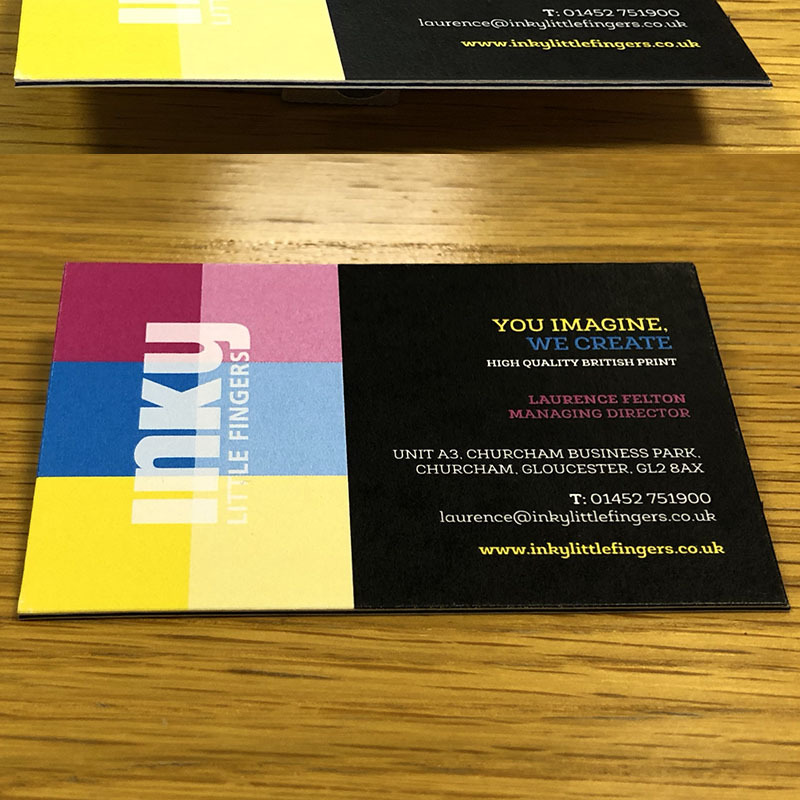 Business card colours will look slightly "brighter" than litho printed compliment slips and letterheads. In addition, because they are printed using a different machine and process the colours may be very slightly different.